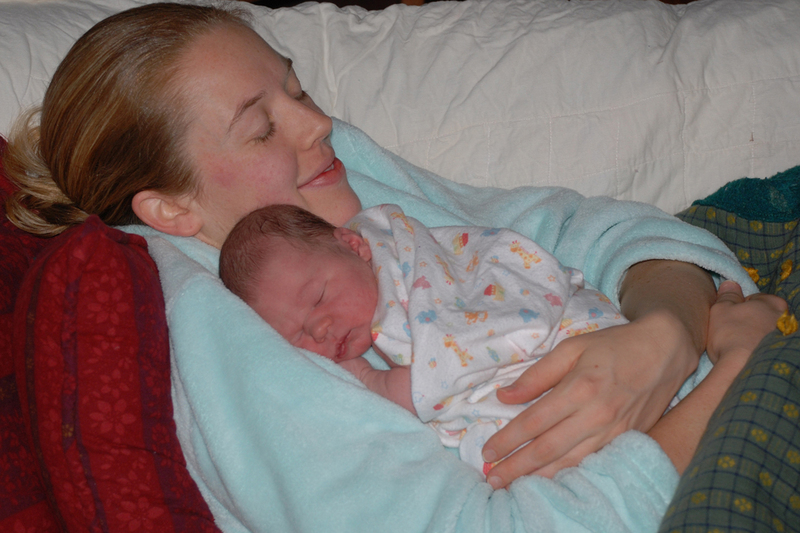 I was seven months pregnant and had cumulatively spent less than three hours thinking about giving birth. In my first trimester I’d perused some of the last chapters of What to Expect When You’re Expecting, read some troubling snippets about epidurals, episiotomies and enemas, and decided to focus my attention on “lighter” subjects like fetal development and nursery themes. I cried all the way home. Thoughts of childbirth only filled me with dread. B’s serene home birth had been one of the most incredible events I’d ever witnessed. Why would I not want the same thing for my baby? I had chosen to have a hospital birth with a certified nurse midwife thinking it would be the best of both worlds, but I just couldn’t feel peaceful about it. I remembered how instantly comfortable I had felt with B’s midwife, K, and how impressed I’d been by the way she interacted with B as she labored. I knew they had a special relationship and lengthy appointments leading up to the birth. Though my experiences at the women’s health center had been positive, I’d probably seen my midwife a whole 20 minutes. I decided to get busy working on my birth plan. As B had pointed out, having a hospital birth would mean that I would need to be assertive and stand up for what I wanted in terms of procedures and interventions—especially in a hospital with a 25% cesarean rate. Up to this time, I hadn’t really even bothered to learn about these choices and possibilities. I found some sample birth plans online and as I began to go through the options a pattern began to emerge: basically, I wanted to turn down just about every procedure the hospital had to offer while at the same time, requesting accommodations that might not be permitted. As I learned about the comfort measures that promoted natural childbirth—and how important it was to be in a place where I’d feel safe and relaxed—it became obvious that a home birth was definitely the best choice for me. I shared what I’d learned with my husband, Clyde, who let me know that he’d support whatever choice I made. I contacted K and was overjoyed to learn that she would be able to be our midwife! We met with K and her apprentice and we began to prepare for our home birth. They spent so much time with us, answering our questions, giving guidance about nutrition and fitness, monitoring my health and the baby’s progress. It was obvious that they really cared and were invested in us. They recommended that Clyde and I take a childbirth class geared specifically for homebirthers. This was a wonderful experience, especially for Clyde. Although I’d been sharing highlights from books I’d been reading, this class really helped him know what to expect and how he could help, even how to catch the baby himself, if needed or desired. I was encouraged and empowered as we learned about the stages of labor and birth and the different strategies that could help throughout the process. My water broke around 3 in the morning. I took a shower and tried to follow the early labor advice I’d received from my childbirth class—try to ignore labor as long as you can and GO TO BED! I slept until around 5 when I woke Clyde to tell him I didn’t think he’d be going to work that morning. Amidst mild contractions we remade the bed and started hauling out supplies. I called our birth team while Clyde made me a comfy spot on the couch and started putting the birth tub together. K reminded me to “think marathon” (first-time moms often have lengthy labors) and encouraged me to rest. By 6 the contractions began requiring my full attention. I tried lying on my side on the couch, then all fours on the floor, leaning over an exercise ball, but about the only thing that seemed to bring relief was Clyde massaging and putting pressure on my lower back. This was a challenge because he was also busy filling up the tub (we’d opted for a water birth) and had discovered that we’d already maxed out the hot water tank. While Clyde continued boiling water and rubbing my back, I called for reinforcements and my dad came by to take over water hauling duties. My contractions were feeling pretty intense and though I knew their frequency and duration was speeding up, I was afraid that I still had a long way to go and hoped I’d be able to handle it. I was a noisy laborer, and when K’s apprentice called to check on us the intensity of my moans in the background let her know she’d better come on over. When she arrived around 9 I was 7 cm dilated and was finally able to get in the tub. The warm water felt great on my back and I felt more relief as I was able to move my hips more easily with the water supporting me. B and K arrived soon afterward. B made sure I kept hydrated and began praying for and coaching me to help my breathing and moaning relaxed and productive. K and her apprentice prepared the supplies for the birth and monitored my progress and the baby’s heart rate. I must have been pretty encouraged by the arrival of our wonderful support team, because I don’t really remember going through a dramatic transition experience. I got out of the water so that K could check me, but was glad to get back in quickly because it definitely was making a difference in my perception of pain. Clyde got in with me and continued to put pressure on my back. Around 10:30 I was able to begin pushing. I’m not sure what I had thought “pushing” meant, but was somehow surprised to find out that it really meant PUSHING! (I think I thought my body would do it for me in some involuntary way, but it turns out that it really means “bear down so hard you see stars.”) It was hard work, but I knew that I was the only one who could push my baby out, so I PUSHED (with no tearing even though he was born with his hand up beside his face)! In less than 2 ½ hours, we held our beautiful baby boy in our arms. Clyde and I were able to take all of the time we needed to just be amazed by this little person—to meet and touch and make eye contact and hold him close, while K almost imperceptibly assisted and monitored as needed. He was alert and calm and a champion eater from the start. It was great to enjoy our first moments and days with our son in the privacy and comfort of our own home surrounded by close friends and family. I am thankful for the journey to homebirth that required me to take personal responsibility for my family in a much deeper way and for the opportunity to have a natural birth. Both of these experiences have been invaluable in preparing and empowering me for the many challenges, decisions and responsibilities of motherhood. Our choice to birth at home required much more from Clyde as well and my love, respect and connection with him deepened through this experience. 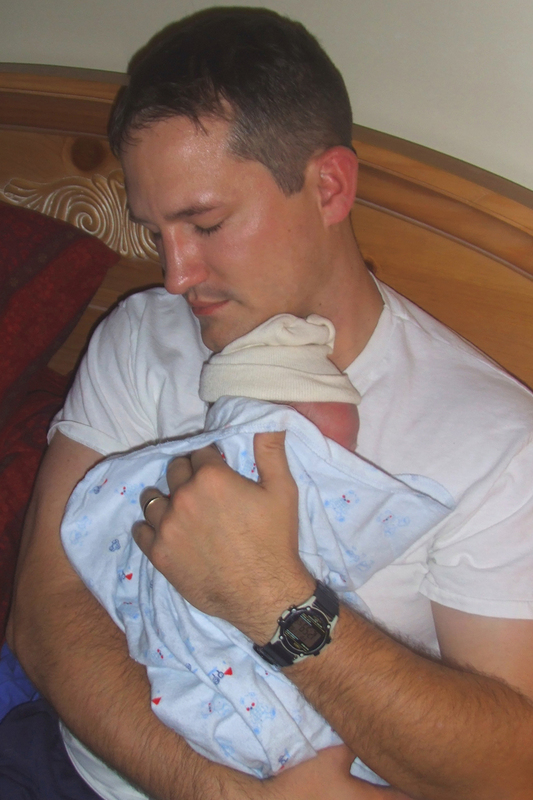 I am unspeakably grateful for the beautiful and peaceful way in which we were able to welcome our son into the world. It’s wonderful to be able to personally testify that birth can truly be a serene and sacred event.